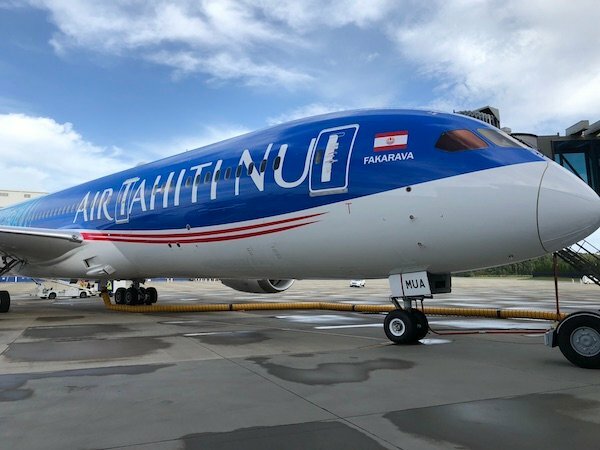 I was recently invited by Air Tahiti Nui (TN) to experience their Boeing Dreamliner 787-9 on a ferry flight from Boeing’s assembly site in Charleston, South Carolina (CHS) to Los Angeles, California (LAX) with a one-hour layover in Oklahoma City (OKC). 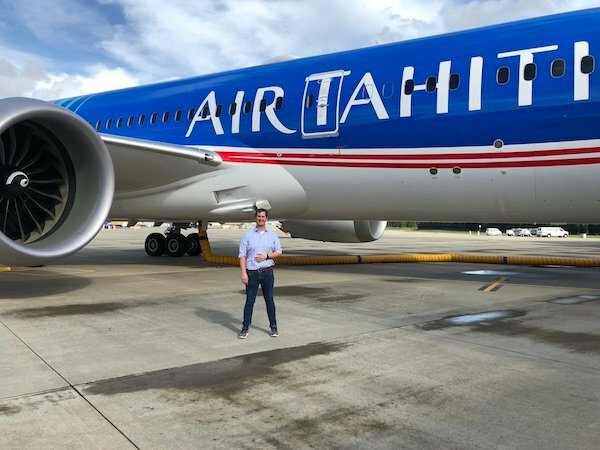 Excited by this opportunity, I made my way down to Charleston to see their Dreamliner in person and experience what Air Tahiti Nui had to offer passengers flying from the West Coast of the US to Tahiti. Air Tahiti Nui’s 787-9 comfortably seats 294 passengers, which is the same passenger count as Air Tahiti Nui’s A340-300, which is being retired next year after over 15 years flying. 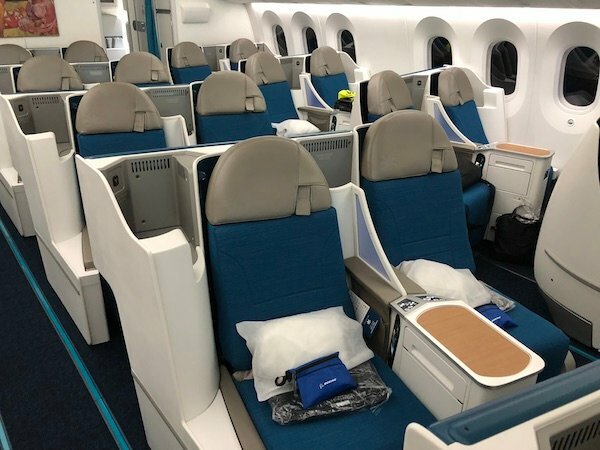 One of the main differences from the A340 is that Air Tahiti Nui introduced their Premium Economy product, “Moana Premium” on the Dreamliner, but more on that later. Poerava Business is made up of 30 lie-flat seats, Moana Premium has 32 recliner style seats and Moana Economy has 232 standard seats. Stepping onto the plane, I was greeted by a picturesque floor to ceiling photo of a beach on Tahiti, what a way to remind passengers that they are about to head to a beautiful French Polynesian paradise. During my time working on seat maps, I have noticed that more and more airlines are going to a 1-2-1 configuration for their business class. 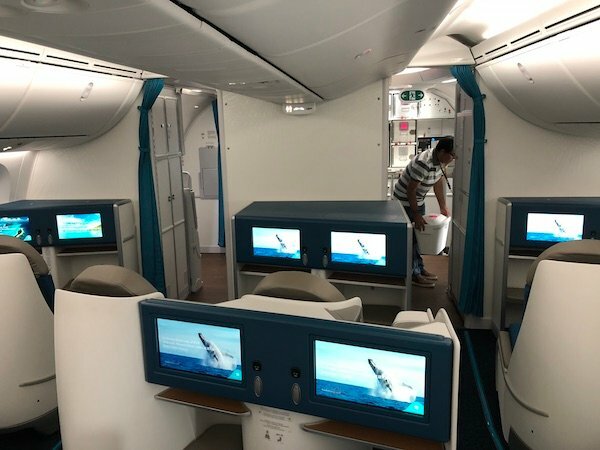 As I walked through Air Tahiti Nui’s Poerava Business class however, I saw that they decided to keep a 2-2-2 arrangement, which is the same arrangement as on their A340s. When asked, Air Tahiti Nui’s Managing Director Mathieu Bechonnet explained that one of the main reasons they kept the 2-2-2 arrangement was because most of the airline’s Poerava Business travelers are couples on their honeymoons or anniversaries, and Air Tahiti Nui wanted to create a more intimate start to their vacations. Frequent flyers will notice that the seats on Air Tahiti Nui’s Dreamliner are Rockwell Collins Diamond seats. I was fortunate enough to be seated in 1B, right on the aisle. Right away, I noticed a wide range of storage areas for items like my water bottle, laptop, iPad, iPhone and carry-on bag. Each seat in Poerava Business Class is equipped with a 16" HD touch screen as well as a touch screen remote control nestled into the center console. I found the touch screen remote control exceptionally useful when I had the seat lying flat, but it was tricky to get the remote in and out of its base without accidentally hitting a button. While walking through Poerava Business, I noticed that 4AL only had one window while the rest of the seats have two. Also, the positions for bassinets in Poerava Business are at seats 1AB and 1LK. Being a tall guy at 6’3”, I was extremely comfortable when lying flat. Since I was at the bulkhead, my footwell was a bit wider than those in rows 2-5, so I would recommend trying to book row 1 if you are tall and are flying on Air Tahiti Nui’s Dreamliner. The extra foot space is icing on the cake. I also was a big fan of the electronically dimmable windows found not only in Poerava Business, but throughout all classes. Since row 1 has three windows, I first thought that I would have to use each control to adjust each window, which could be bothersome. Predicting this, Air Tahiti Nui programmed all three windows to be dimmable with one controller. 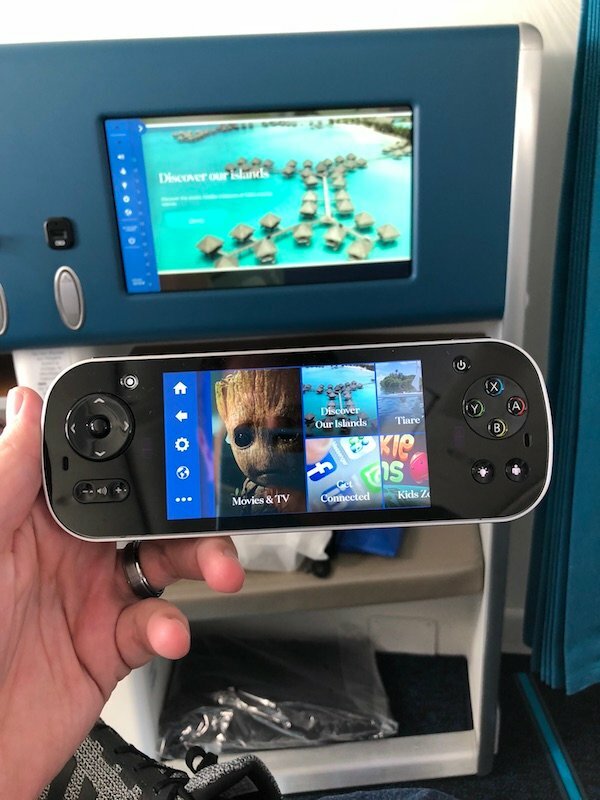 I was very impressed with Air Tahiti Nui’s selection of movies, TV shows, games and overall entertainment during the flight. Being a fan of having a lot of options, I also brought my iPad and watched some TV shows on it, all while charging my iPad using one of the two USB ports provided at each seat in Poerava Business Class. For those who would rather do some work, Air Tahiti Nui also provides standard universal power outlets at all seats. 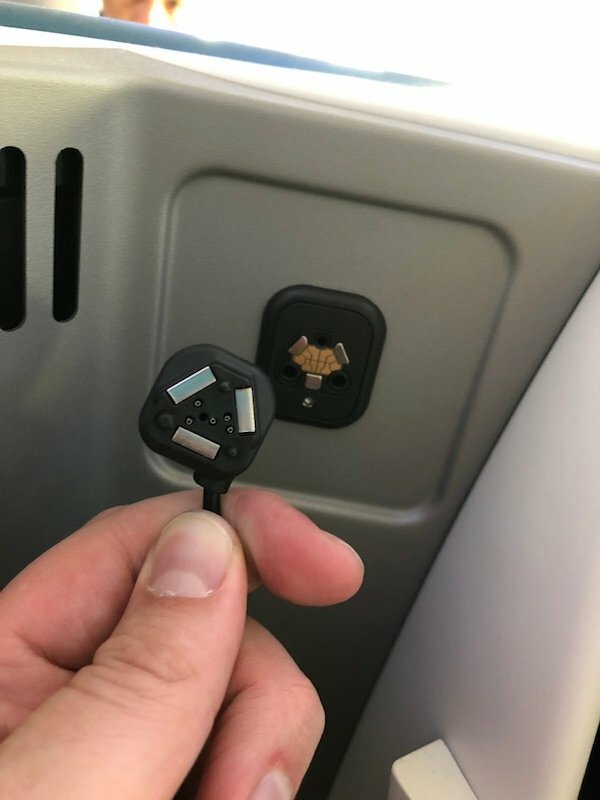 It is also important to note that Air Tahiti Nui provides their own headsets in Poerava Business that have a special magnetic adaptor. 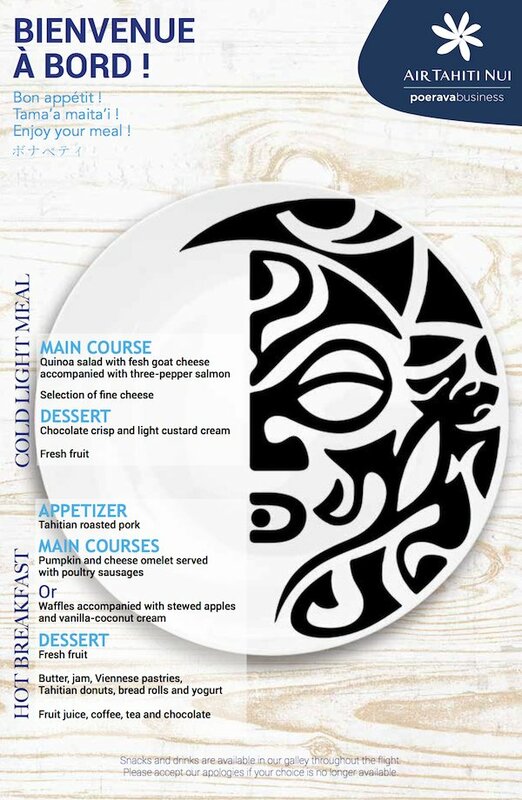 Air Tahiti Nui designed their menu around giving travelers a taste of the island. Poerava Business passengers are provided two meals during their flight from LAX to Fa'a'? International Airport, Papeete Tahiti, (PPT), a cold light meal as well as a hot breakfast. 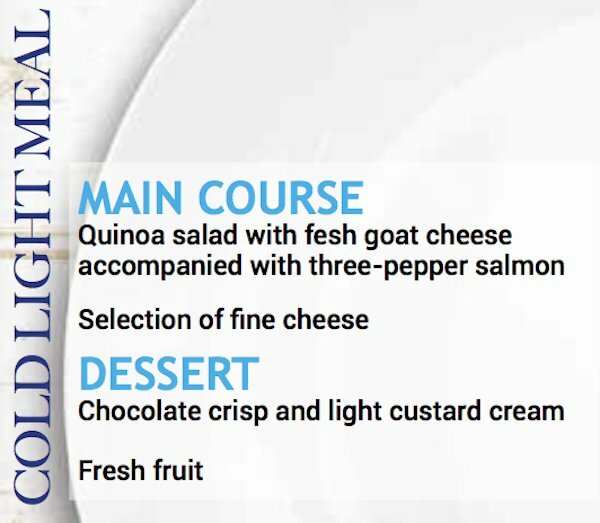 For the cold light meal, passengers are provided with a main course of a quinoa salad with fresh goat cheese that is accompanied with a three-pepper salmon and a selection of cheeses. For dessert, Air Tahiti Nui serves chocolate crisps with light custard cream as well as fresh fruit. Following the cold light meal, passengers in Poerava Business are served an appetizer of Tahitian roasted pork and one of two main courses. 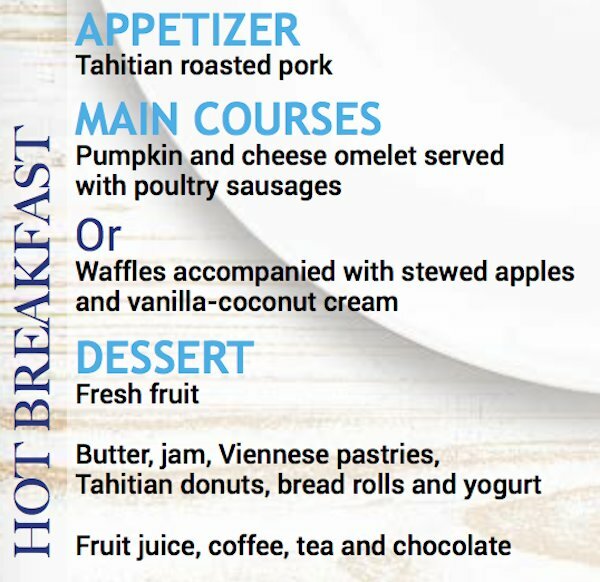 For breakfast, you can either enjoy a pumpkin and cheese omelet served with poultry sausage or waffles topped with stewed apples and a coconut-vanilla cream. Air Tahiti Nui also provides a wide range of Viennese pastries, Tahitian donuts and bread rolls that can all be topped off with butter and jam. After spending a part of my flight in Poerava Business Class, I can honestly say that Air Tahiti Nui provides amazing service for a great product. That picturesque floor to ceiling photo of a beach on Tahiti that greeted me when I stepped on board was a sign to come of the warm, relaxing and elegant service that awaited me in Poerava Business. 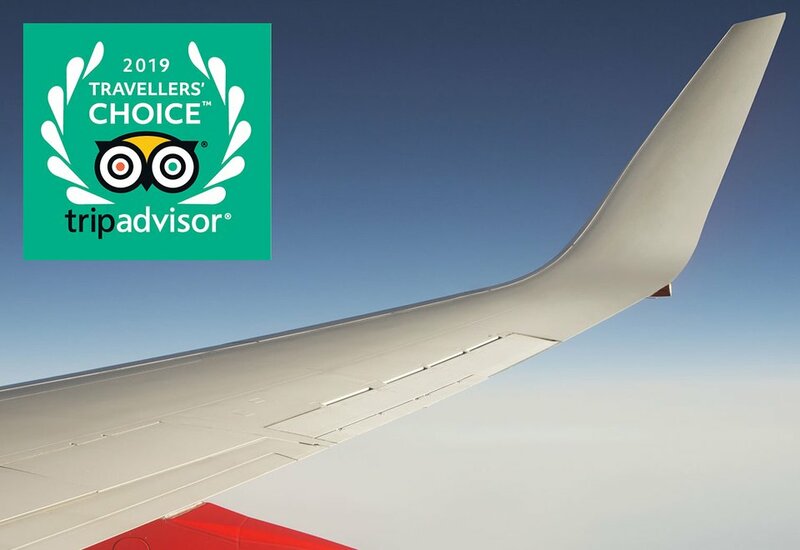 I would like to thank Air Tahiti Nui for inviting me to review an aircraft of which not only they, but the people of Tahiti, are extremely proud. Make sure you read my review of Moana Premium and Moana Economy.